I AM!! Even though that’ll be a busy week for me work wise, I still plan to participate because every little bit counts in Bout of Books! What is Bout of Books, you ask? It’s always a ton of fun, with loads of people participating in different ways. There’s challenges and prizes and JUST JOIN US ALREADY!! HOLY CRAP. THIS IS LESS THAN A MONTH AWAY!! Excite!!! I’m totally participating! Last August was my first BoB and I LOVED IT! 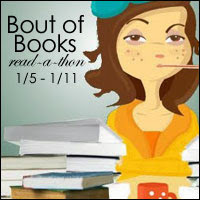 Oh, this sounds like my kind of read-a-thon! Thanks for sharing, I think I’ll be participating as well! YAYYY! Yes, I love how laid back it is. Def join us! It’ll be fun! I think I may have to join this one. Thanks for sharing. I’m totally excited about this round of Bout of Books!! I think it’s a great way to start off the new year, don’t you?? Happy reading!! This is going to be my first BoB and I love the acronym, lol! LOL It’s really fun calling it BoB, huh? You’re going to have so much fun!! I promise!